As reported last year, 50 stamp plaques featuring popular stamps that have a special connection with UK locations, were affixed to on 50 postboxes around the country. 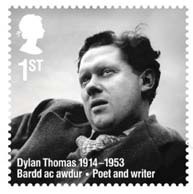 The one honouring Welsh bard Dylan Thomas was put on a postbox near the Dylan Thomas Centre in Swansea. Now, the South Wales Evening Post reports that Royal Mail has placed a special commemorative stamp plaque of Dylan Thomas on a special postbox on the set of Pobwl y Cwm. The long-running Welsh language soap opera has a set in the capital and keen observers of the show will notice the addition of a red postbox complete with the Dylan stamp affixed, on the pavement outside the fictional Tomos ac Elis estate agents. I like the idea of these special postboxes but wouldn't it be wonderful if covers posted in them received a special cancel? Clearly that's wishful thinking since Royal Mail seems incapable of cancelling letters posted in any box - doubtless it would be too expensive and logistically beyond Royal Mail's abilities even though they did succeed in issuing all those Olympics winners stamps in super quick time in 2012 and can deliver post to the remotest parts of the kingdom. Still, it would make a nice souvenir for visitors and tourists. Sadly I have even now be unable to locate the special box alleged to be in Birmingham. The stamp used depicts Chamberlain Square but that is entirely closed off to the public as the demolition of the monstrous 1960s library situated there carries on apace. I haven't been able to find the special postbox anywhere else in the city. Does anyone else know if it really exists and, if so, where it is? Cant directly help but have you tried contacting the letter box study group who may have the info you require.